I could feel the blood rush to my cheeks. “In the end, it’s all the same, right? Don’t you agree?” he asked. “Uh, yeah, sure,” I muttered. Applause. I hadn’t expected to find myself in this situation; standing in front of hundreds of students and professors as Native American poet Simon Ortiz answered my question with a question of his own. The 2015 Sigma Tau Delta International Convention held in Albuquerque, NM, was my first convention, so a couple of friends and I decided to attend the lecture to hear Mr. Ortiz speak on the 2015 Common Reader, From Sand Creek. Having not read the work myself, there were a few instances that were hard for me to connect with, but overall I really enjoyed his talk and appreciated his perspective on traditional/oral history as deserving of academic recognition. During his presentation, he briefly mentioned a desire held by native tribes to follow the will of God as they dealt with their struggles with the oppressive American government forcing them from their homes in the 1800s. 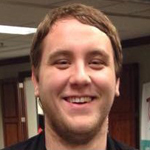 As a self-proclaimed Christian, my interest was piqued by his reference and I began formulating a question to ask during the question and answer time. My question was this: Do you see God in the trials of the native tribes? If so, how, and what do you see? I suppose it ended up being two questions. In his reply he talked about his idea of “God” as more of a force or being that all humans are connected to, we just call it by different names. That, “In the end, it’s all the same.” At this point, he bounced the question back to me. I wasn’t prepared, and awkwardly mumbled an answer just to make the moment end. At least I still got applause. Looking back, his answer really got to the heart of something important. We all need a connection to something greater than ourselves. For many, including myself, that entity is a divine being affectionately called God. For others, it’s the betterment of oneself, one’s community, and one’s word. There are many forms, none of which are mutually exclusive. 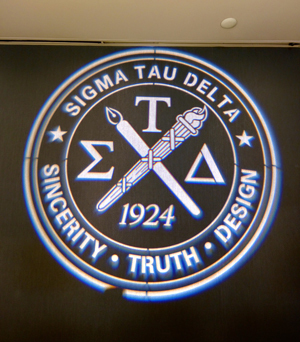 Sigma Tau Delta, by its very nature, focuses on these varying ideas of connection through sincerity, truth, and design. My first convention showed me that and I can’t wait to see what it’ll show me next.